We waited a very long time for Legion Pulse to come out, we were not disappointed. In the fitness word, some brands are super-human in their ability to practice higher standards and deliver premium quality supplements. Legion Athletics, makers of Pulse are one of these super-human brands. Why are they so far ahead? Most likely because they are led by Mike Mathews, fitness expert and author who has helped tens of thousands of people improve their fitness with and without supplements. Basically, he is an honest fitness advocate who has ridiculously sick work ethic… And that work ethic is directed towards helping people, not scamming them. It’s this extra effort on his part that is exactly why Legion supplements are getting better reviews and out-performing mainstream giants… Not just by an inch, but a mile. 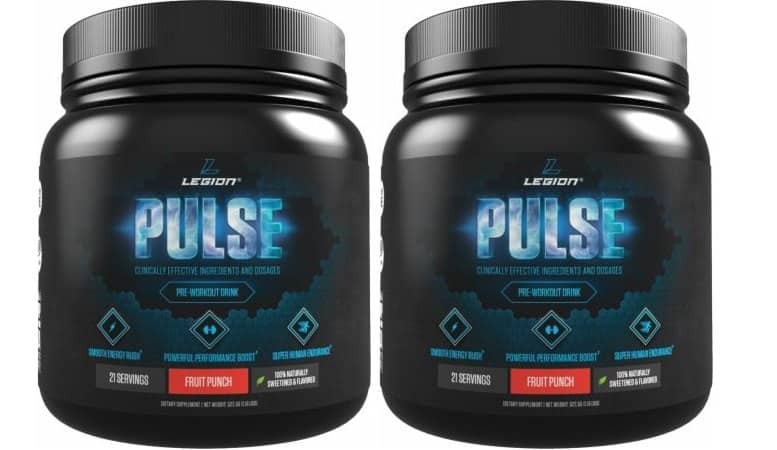 Legion Pulse Quick Review: Compared to other popular pre workouts, Legion invests heavily into scientifically proven performance enhancing ingredients like l-citrulline malate, beta-alanine, and betaine. These 3 ingredients contribute to roughly 15 grams of Pulse… Compared to most pre workouts that total under 10 grams when you add in sugars and stimulants. Overall, Pulse delivers extreme energy and a really, really good performance sustaining pump. This is a true premium grade pre workout made with clean ingredients. Energy wise, Pulse pre workout is clean and to the point. Pulse contains a mixture of caffeine anhydrous (350 mg) as well as L-theanine (350 mg). This is a huge caffeine dosage, however the corresponding l-theanine curbs the bluntness of it, making it a more functional experience. Overall, this is a great dosage for stimulating the central nervous system to send stronger impulses. 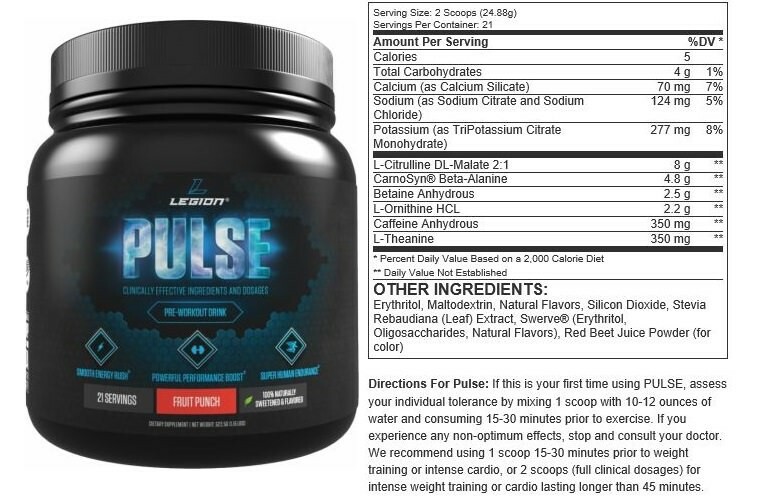 Legion Pulse doesn’t contain creatine, or other direct strength enhancers. However, the caffeine dosage is strong enough to make your nerve impulses deliver stronger reactions. Pulse doesn’t just contain l-citrulline… It contains l-citrulline malate. That malate component is basically pure energy for your muscle cells. Pair this with the beta-alanine and caffeine in Pulse and your endurance will notably improve. Just make sure to stay hydrated and not rev up your heart-rate too crazy since the caffeine is high. Since Pulse doesn’t include any grey-area stimulants, the come-down is relatively clean and easy. The l-theanine greatly helps as well, but a 300+ caffeine dosage is never going to be totally graceful. With this in mind, for days that you don’t feel the utmost need to take Pulse, let it slide or only take half a serving. One thing that separates Pulse pre workout from the pack besides including hugely dosed ingredients, is their dedication to clean flavoring and sweetening. With that, understand that Pulse isn’t going to taste like candy. However, thanks to the 4 grams of carbs in there- the flavor is definitely doable on a daily basis and not at all a reason to deter from this product. 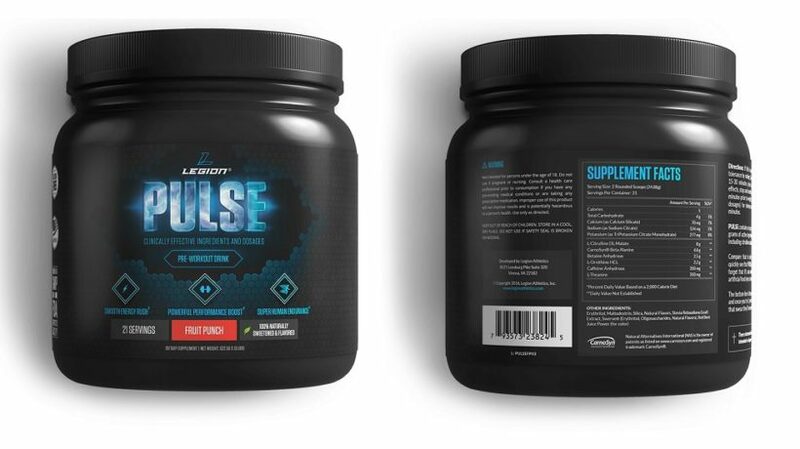 Legion Pulse is value packed compared to other pre workouts, however it does only contain 21 servings per container. If you only want a kick of energy, then with Pulse you are getting more than you are asking for. However, if you really want a fully-dosed all-in-one pre workout, then you should be happy to pay the extra price for extra care! Pulse isn’t the only value-packed clinically dosed pre workout. Transparent Labs Bulk – Better stimulant matrix and less crash than Pulse. However pulse contains a larger dosage of l-citrulline malate and beta-alanine. NutraBio PRE – Pulse tastes better and performs better but NutraBio’s stimulant matrix hits harder in a very aggressive way. NutraBio PRE uses sucralose though. 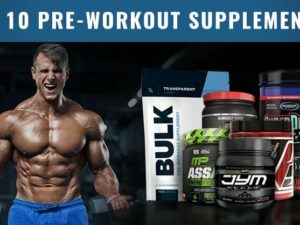 Pre-Jym by Jym Supplement Science – Same concept but not as effective, Pulse is like Pre-Jym 2.0. Pre-Jym contains BCAAs and alpha GPC which isn’t present in Pulse. From start to finish, Legion Pulse did not let our team down. It did exactly what it said it was meant to do. No faulty advertising, just pure results. We’ve been fan-boys of Mike Mathews for quite some time due to the awesome free content he posts on MuscleForLife.com… And now we look up to him even more for the great work he has done with Legion. If you value a high quality product, Pulse is right up there with the best of the best – no question. Many of these same ingredients are used in other pre workouts. The thing to note, are the huge dosages – clinical dosages. 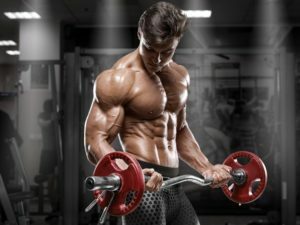 L-citrulline dl-malate 2:1 at 8 grams: This is the l-citrulline form and dosage that has had the greatest number of positive clinical studies. Carnosyn beta-alanine at 4.8 grams: This is the largest beta-alanine dosage that we’ve ever taken in a pre-workout. Many brands may act like this is excessive, but according to the research, it’s just right with 3.2 to 5 grams being the optimal dosage. Betaine anhydrous at 2.5 grams: Betaine is less-frequently under-dosed, but a solid ingredient nonetheless. L-ornithine HCL at 2.2 grams: Definitely super-charges the l-citrulline malate and improves endurance (1). Caffeine anhydrous at 350 milligrams: This is a pretty big caffeine dosage, but it works well in this formula. L-theanine at 350 milligrams: If we could change anything, it would be to increase this l-theanine dosage to make the caffeine smoother. But regardless, its significantly more than most brands are willing to include. Maltodextrin carbohydrates at 4 grams: Likely for natural flavoring. While taking Legion’s pre workout Pulse, we did both heavy lifting and cardio training. On heavy lifting days, the full serving size was ideal for a solid lift. However on cardio days, half a serving was plenty. Despite which training you perform, be sure to take Pulse with a full glass of water and stay hydrated while you lift. This will compliment Pulse’s natural energy promoting formula, as well as ensure the huge raw caffeine dosage doesn’t make you too jittery. Another big plus for this pre workout is its all-natural flavoring, sweetening, and dyes. You’d be amazed how much artificial garbage some pre workouts contain. Legion on the other hand doesn’t participate in that game, and we appreciate it. Feel free to send us your feedback or questions regarding pulse. We can’t compliment it enough!